River rafting and camping on the American river. 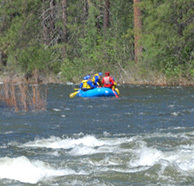 Both boy and girl scout groups have been coming to the Whitewater Excitement camp each year for the last 30 years to raft, camp, earn merit badges, learn about the river, whitewater techniques, and have a fun time on the American River. All of our prices for Scout Group trips are reduced rates from our standard retail prices. 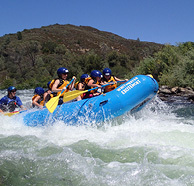 Our California youth rafting trips are 20-30% lower than our retail prices. Our scout program has been designed to make our adventures affordable and to give youth the opportunity to explore our natural world. Call us at 1-800-750-2386 or fill out our check availability form below. We are your professional partners for planning the best in California Scout group outdoor adventure experiences. Over the past 30 years we have helped scouts earn whitewater merit badges, learn about river and it’s surrounding environment, and have a fun and safe experience. We are careful to assess each group’s individual needs and expectations, we provide a complete outdoor adventure program, learning opportunities, awesome and hearty meals, comfortable private riverside camp right on the banks of the South Fork of the American River and Scout support services you may require. We promise to help make your Scout troop’s adventure the best it can be! Young people’s participation is a big reason why they get so much out of an outdoor adventure experience. However, it’s more than that, it’s about taking kids out of their normal electronic life style, and putting them in a place where learning, growing, sharing and meeting new people, and overcoming new challenges happens. Our entire staff is dedicated to providing the best experience for our scout group. If you have questions about our whitewater or kayaking merit badge programs, camping, or whitewater rafting adventures, please feel free to give us a call at 1-800-750-2386 and we would be happy to help and answer any questions that you have. 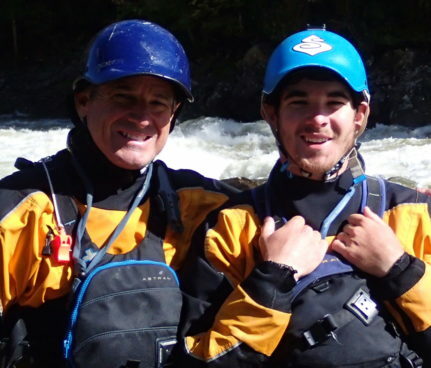 Norm and Phillip have over 50 years of combined whitewater river rafting and kayaking experience. From the easiest river to the hardest class V trip that can be found, they have done it. Both Norm and Phillip can lead whitewater merit badge seminars prior to your troops departure that will be both informative and captivating for the troop. We can include on and off river skills and customize the trip to your troops specific needs. Please call for information. 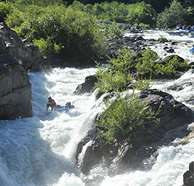 For more information about scouting opportunities with whitewater merit badges check out Kayakbadge.com. They list many different kinds of trips and options.